Being No One, Going Nowhere attempts to explore intellectual themes while still retaining the band’s vivacious dance pop. It's hard to believe that Joshua Hodge's band STRFKR, who just two albums ago covered Cyndi Lauper's “Girls Just Want to Have Fun", are now infusing Eastern philosophy into their psyched-out dance pop. The result of this odd fusion furthers the band's attempt to move in a more serious direction and yields perhaps their best work yet. Written mainly by Hodges as he wandered around the sparsely beautiful Joshua Tree desert in California, Being No One, Going Nowhere attempts to explore intellectual themes while still retaining the band's vivacious dance pop. If their last album, Miracle Mile was Hodges' fearful exploration of his own mortality, then this time around he seems more at peace with the prospect of death, and more anxious about how to live. Being No One, Going Nowhere finds Hodges contemplating his own personal identity, meditating largely on his place in the cosmos and the quiet struggle of individuality and personality. Hodges explains the origins of this concept as “Kind of an eastern idea I read about. Not totally sure I understand it, but as far as I think I get it, it has to do with our commitment and attachment to our sense of self, like who we think we are. 'I am Josh Hodges of Portland, of that band, etc.' Just like all the stories we learn and tell ourselves about ourselves. That belief system can create a lot of suffering." It seems then that Hodges is preferring now, even more than before to take his songwriting approach in a more focused direction that is strikingly personal and aligned to his own personal development. He's taking on difficult concepts, rebelling against the vain conception of individuality, a truly alienating idea for most Western audiences but a bold and important message nonetheless. These ideas can be heard especially on the album's second half. The vocals grow more distant, as Hodges' voice is absorbed deeper into the cosmic sound coming from his band. The results are dark and sometimes mesmerizing as the band members seem to disappear into one another more than ever (see “Maps" and the strong closer “Being No One, Going Nowhere"). 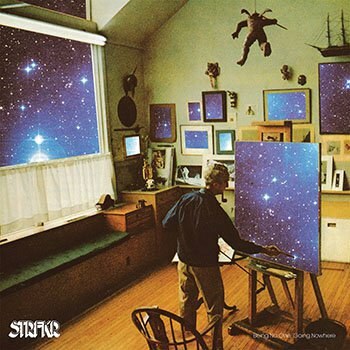 However, with STRFKR's attempt to maintain their very contagious dance beats, the album seems to clash with itself a number of times. For example, the musings of philosopher Alan Watts on the cosmic self amidst a backdrop of trippy synth on “interspace" clashes when paired next to the melodramatic, and adolescent focused “Open Your Eyes". It is their inability then to depart from their “safe zone" that keeps this album from being great, although it certainly finds them moving in the right direction. In the end, then, STRFKR is taking on larger ideas. However, the end result can't help but sound like a mixed bag that seems like a rehash of their own weathered ideas as well as those of the genre. In other words, Being No One, Going Nowhere is like just another one of the celestial representations hanging in the painter's studio on the album's cover, closer to a quiet and sometimes profound replica rather than the real thing. But one can't help but wonder with the theme of this album, is that exactly what Hodges wants it to be?